One major problem with understanding Alzheimer's is not being able to clearly see why the disease starts. A super-resolution "nanoscope" developed by Purdue University researchers now provides a 3-D view of brain molecules with 10 times greater detail. This imaging technique could help reveal how the disease progresses and where new treatments could intervene. The instrument helped Indiana University researchers better understand the structure of plaques that form in the brain of Alzheimer's patients, pinpointing the characteristics that are possibly responsible for damage. Published findings appear in the journal Nature Methods. Long before Alzheimer's develops in an individual, waxy deposits called amyloid plaques accumulate in the brain. These clusters interact with surrounding cells, causing inflammation that destroys neurons and creates memory problems. The deposition of these plaques is currently the earliest detectable evidence of pathological change leading to Alzheimer's disease. "While strictly a research tool for the foreseeable future, this technology has allowed us to see how the plaques are assembled and remodeled during the disease process," said Gary Landreth, professor of anatomy and cell biology at the Indiana University School of Medicine's Stark Neurosciences Research Institute. "It gives insight into the biological causes of the disease, so that we can see if we can stop the formation of these damaging structures in the brain." The limited resolution in conventional light microscopes and the natural thickness of brain tissue have prevented researchers from clearly observing 3-D morphology of amyloid plaques and their interactions with other cells. "Brain tissue is particularly challenging for single molecule super-resolution imaging because it is highly packed with extracellular and intracellular constituents, which distort and scatter light—our source of molecular information," said Fang Huang, Purdue assistant professor of biomedical engineering. "You can image deep into the tissue, but the image is blurry." The super-resolution nanoscopes, which Huang's research team has already developed to visualize cells, bacteria and viruses in fine detail, uses "adaptable optics—deformable mirrors that change shape to compensate for light distortion, called "aberration," that happens when light signals from single molecules travel through different parts of cell or tissue structures at different speeds. To tackle the challenge of brain tissue, Huang's research team developed new techniques that adjust the mirrors in response to sample depths to compensate for aberration introduced by the tissue. At the same time, these techniques intentionally introduce extra aberration to maintain the position information carried by a single molecule. The nanoscope reconstructs the whole tissue, its cells, and cell constituents at a resolution six to 10 times higher than conventional microscopes, allowing a clear view through 30-micron thick brain sections of a mouse's frontal cortex. The researchers used mice that were genetically engineered to develop the characteristic plaques that typify Alzheimer's disease. 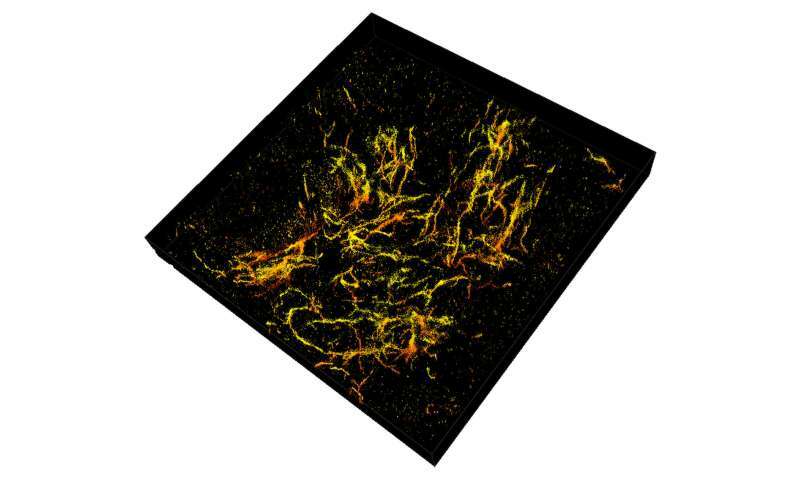 Landreth's lab found through these 3-D reconstructions that amyloid plaques are like hairballs, entangling surrounding tissue via their small fibers that branch off waxy deposits. "We can see now that this is where the damage to the brain occurs. The mouse gives us validation that we can apply this imaging technique to human tissue," Landreth said. 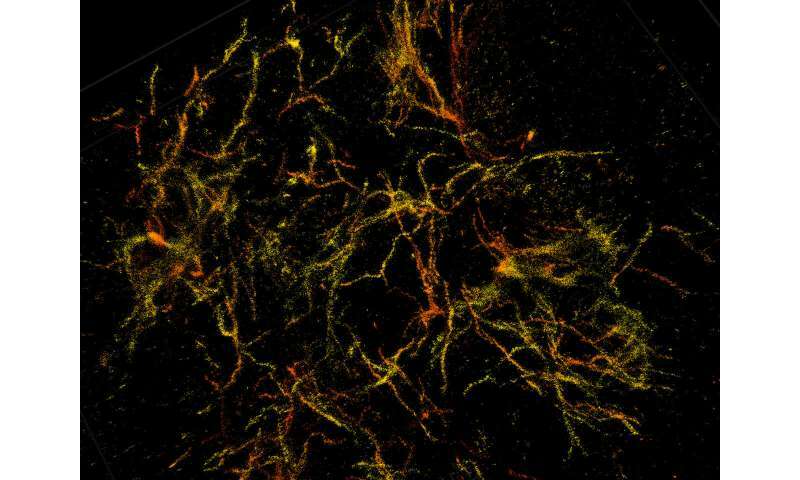 The collaboration has already begun work on using the nanoscope to observe amyloid plaques in samples of human brains, as well as a closer look at how the plaques interact with other cells and get remodeled over time. "This development is particularly important for us as it had been quite challenging to achieve high-resolution in tissues. We hope this technique will help further our understanding of other disease-related questions, such as those for Parkinson's disease, multiple sclerosis and other neurological diseases," Huang said.